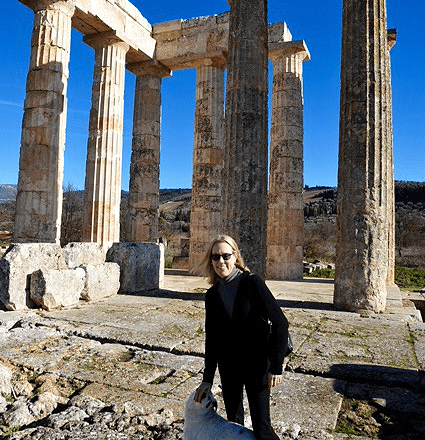 Dr. Ann Woods, professor of art history, shares discovering her love for art history in France, her background in Roman art and architecture, and the importance of a liberal arts education. Artwork by artwork and building by building, Professor Ann Woods is opening up UC San Diego’s students to the world of art history and architecture. She channels her own passion for the history and storytelling she sees in art around the world to share it with her students, many of whom have never been introduced to the subject before. Woods got her first look at the world of art history when she visited Tokyo as a child and stayed at the Imperial Hotel, which was designed by the famous American architect Frank Lloyd Wright. Woods didn’t realize her passion for art history until she spent her junior year of her undergraduate education in Paris. After taking a few art history classes in one of the most beautiful cities in the world, she fell in love with the subject. Inspired by the history behind the art and structures she had admired for a year, Woods went on to get her doctorate at UCLA. Though she originally thought she would focus on nineteenth-century French art and history, she eventually decided to specialize in Greco-Roman art and architecture, with a minor in medieval art. She completed a dissertation studying the tombs of a Roman priesthood of ex-slaves that documented their ascent into Roman society. Her face lit up as she elaborated on a subject near and dear to her. Eight years ago, Woods joined the City of San Diego’s Historical Resources Board in an effort to learn about San Diego architecture, so that she could incorporate it into her history of architecture class. She now serves as the board’s art historian. While teaching her Introduction to Art History class, Woods found that many of her students’ minds have been broadened while learning about ancient societies. She believes art history is a truly interdisciplinary subject which can aid students in their other classes and even in other walks of life. “I’ve had people take history classes and then say, ‘I’ve actually learned more history in art history classes than in history class.’ I think they remember it better,” Woods remarked. There are common misconceptions on campus — chock full of science, technology, engineering, and math majors — that a major like art history isn’t applicable to life after the undergraduate years. According to Woods, that just isn’t the case. She believes there are many things you can do with an art history degree. “There’s teaching of course, and not just at the university level. There’s museum work and programs in arts administration and museum studies. There’s writing for art magazines or columns like the art critic in the New York Times, and there are lawyers who specialize in artistic copyright,” Woods pointed out. Furthermore, the major is versatile. Woods is earnest in emphasizing the value of pursuing what interests you and what you will succeed at while in college; one can never know what path it might lead them down. Woods thinks that part of getting a college education is building up a cultured mind that is open and knowledgeable about the world around you. As a frequent international traveler (she’s been to Oxford, Prague, Budapest and Greece in the past year alone), Woods knows firsthand how much more rewarding a trip abroad is when one has plenty of knowledge about the sights they’re seeing in their back pocket. Woods’ favorite part about teaching, besides the fact that there are always new things to discover about art history, is the fact that her subject matter is exciting to students — at first, they don’t quite know what to expect, but they become interested in spite of themselves.